The new FHD553-X ultra-narrow bezel flat panel offers full HD resolution, high pixel density and an LED-backlit screen. The What: The new Christie FHD553-X flat panel delivers better than ever brightness uniformity and can be installed in either portrait or landscape mode. 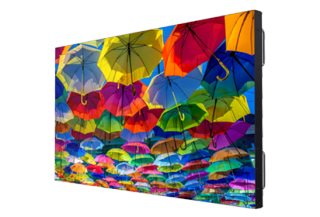 Replacing Christie FHD552-X, the new FHD553-X ultra-narrow bezel flat panel offers full HD resolution, high pixel density and an LED-backlit screen. Images look crisp and sharp at any distance or angle, making it suitable for indoor applications including corporate lobbies, boardrooms, museums, retail, sports venues, and more. The Bottom Line: The Christie FHD553-X comes with a three-year parts and labor warranty and is now shipping.